100W is an international artist and writer residency located in Corsicana. It holds open studio this Saturday. 100 W Corsicana is an international artist and writer residency located in Corsicana. On Saturday March 23, from 6 to 9 p.m., the public will have the opportunity to see what the residents have been working on. Amanda Valdez, Trey Burns, Lucas Schaefer, and Pam Neal are the showcased artists and writers. The readings begin at 4:30 p.m. Artist Amanda Valdez is from New York. She has a 3rd floor studio of 100 W. She knew she needed a residency with a large space because her works, inspired by “the histories of the human body” according to Valdez’s website, are sometimes expansive pieces that require conceptualizing how gallery space should be used. Her friend and colleague Caris Reid previously was a resident, so “100 W Corsicana had been on my radar for years as a quiet, unique, and quintessential large Texas space,” Valdez said in a press release. Resident Trey Burns, of Dallas, will also have his art shown in Open Studios. A graduate of the Savannah College of Art and Design, Burns creates installations and digital art, including film, animation, and photography. He is passionate about creating artwork based on his generation’s upbringing. In Corsicana, he’s exploring new topics. “I think the tidiest way to describe this residency for me at 100 W is as research. A meandering inquiry into the landscape and history of Corsicana and the surrounding area,” Burns said. Burns is also exploring Lyndon B. Johnson’s 1948 visit to Corsicana via helicopter. In a press release, Burns said LBJ’s use of aircraft to campaign was “an innovation in politics at the time” and he’s interested in the “airborne spectacle” that helped LBJ secure a highly contested Senate election. 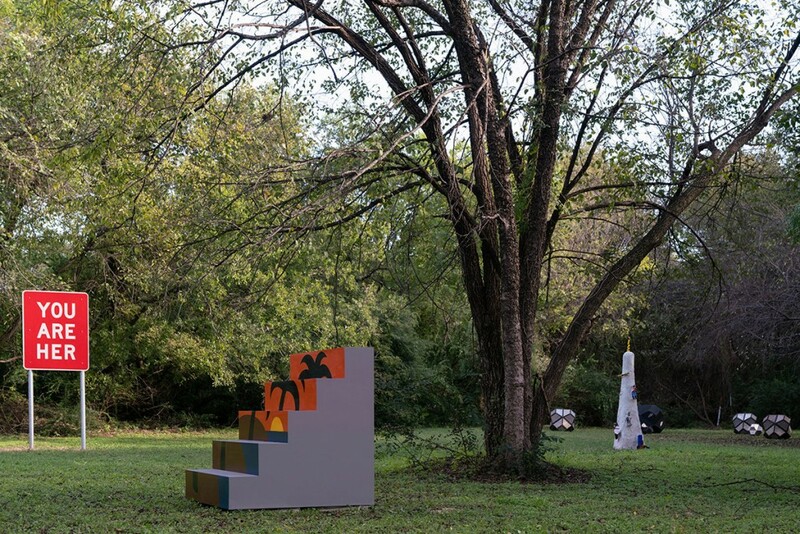 Trey Burns and Tamara Johnson created Sweet Pass Sculpture Park in West Dallas. Experience the works of Burns, Valdez, Pamela Neal, and Lucas Schaefer on Saturday, March 23.